I’m delighted to feature a special recipe from the just published Sunday Brunch here today. This tart is simplicity itself to prepare and has been a long-time favorite with students in my cooking classes. The recipe (like all those in the book) includes metric equivalents—a help, I hope, to those cooking abroad. With its flaky crust and delectable topping of sweet grape tomatoes and creamy blue cheese, this tart makes a tempting vegetarian dish for brunch. The exceptionally crispy pastry shell is prepared with cream cheese and seasoned generously with cayenne pepper. The tart can be baked several hours ahead, left at room temperature, and then quickly reheated. 1. Arrange a rack at center position and preheat the oven to 375 degrees F/190 degrees C/gas 5. Have ready a 9-in/23-cm tart pan with a removable bottom. 2. For the crust, place the flour, cream cheese, butter, salt, and cayenne pepper in a food processor; pulse until the mixture resembles coarse meal. Remove and knead the mixture into a smooth mass, and then press it with your fingers in an even layer into the bottom (not up the sides) of the tart pan. Smooth the dough with the back of a spoon. Freeze the tart shell 15 minutes to firm, and then bake the crust until golden brown, 30 minutes. 3. Remove the tart shell from the oven and cool for about 5 minutes. Sprinkle the cheese evenly over the crust. Arrange the tomatoes in a circular pattern and in a single layer over the cheese, cut sides up. You may not need to use all of the tomatoes. Whisk together the oil and vinegar in a medium bowl and drizzle over the tomatoes, and then sprinkle with salt. Place the tart shell on a baking sheet to catch any drippings and return to the oven and bake until the cheese has melted and the tomatoes are hot, 10 to 12 minutes. 5. To serve, place the tart on a platter. 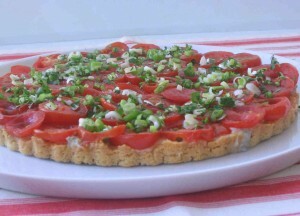 Mix together parsley and green onions, and sprinkle over the tart. Cut the tart into 6 wedges. Market note: Small grape tomatoes, which have a sweet flavor, work better than larger cherry tomatoes in this recipe, and can be used year round. However, in the summer feel free to try the tart with one of your favorite varieties. Sweet ones that are on the small side work best. This entry was posted in 2012 Recipes, Light Main Course, Main Course, Market to Table, Recipes and tagged blue cheese, brunch, grape tomato, Sunday Brunch, tart by brosbottom. Bookmark the permalink.